While at the Smithsonian’s American History Museum, I also took some time to locate other phonograph-related items on display. I was pleased to find that there were a few rare artefacts that hint at the museum’s formidable collection. I was most impressed with the "Bergmann" tinfoil phonograph that I located in an "Innovations" display. These tinfoil phonographs were manufactured for the Edison Speaking Phonograph Company in 1878 by Sigmund Bergmann in New York and a little research indicated that the museum has two machines by Bergmann, with the phonograph on display being one of the three known early-style machines in existence (referred to as the Experimental Exhibition "Bergmann" phonograph). The one on display was donated to the museum by Edison’s associate William Hammer. As for the other two known Experimental Exhibition "Bergmann" phonographs, one was given to Henry Ford by Thomas Edison in 1929 while the other resides at the Edison National Historic Site in West Orange N.J.
All three machines have subtle differences but can be distinguished from the later Exhibition Phonographs made by Sigmund Bergmann as they have double flywheels and somewhat more elaborate decorations. 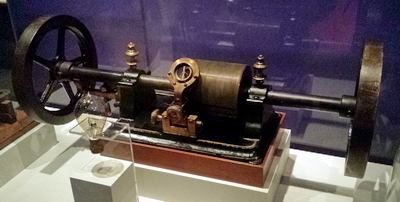 The other tinfoil phonograph in the museum’s collection (but not on display) is the similar but later Edison Exhibition Phonograph, also by Sigmund Bergmann, which was donated to the museum by Thomas Edison in 1929. Another tinfoil phonograph on display was the Edison Parlor model by Brehmer Brothers (it appears that the Smithsonian collection includes 4 of this version of the Parlor Phonograph). This small machine was intended to be marketed to the public but disappointing sales resulted in only small numbers of these being produced, with possibly less than 20 known to have survived. In another area of the museum, I located an Edison Talking Doll which was a dismal marketing failure when introduced to the public in 1890. In spite of the significant problems and its costly failure for Edison and his investor, this product does mark a milestone as it was the first recorded audio product sold for home entertainment. The doll, which stands 22 inches high and weighs 4 pounds, was originally sold for $10 with simple chemise or $20-$25 with full dress. The phonograph located inside the doll’s chest was not spring-driven but played by turning a crank at a steady speed. The failure of this venture can be attributed to the fragility of the wax records and of the mechanism, with the steel needle causing the cylinder records to rapidly wear. After numerous returns, production was ceased and the remaining dolls were sold off without the motors. Unfortunately, the one machine that I was not able to locate was Emile Berliner’s original gramophone, which probably resides somewhere in the museum’s storage but is not presently on display.